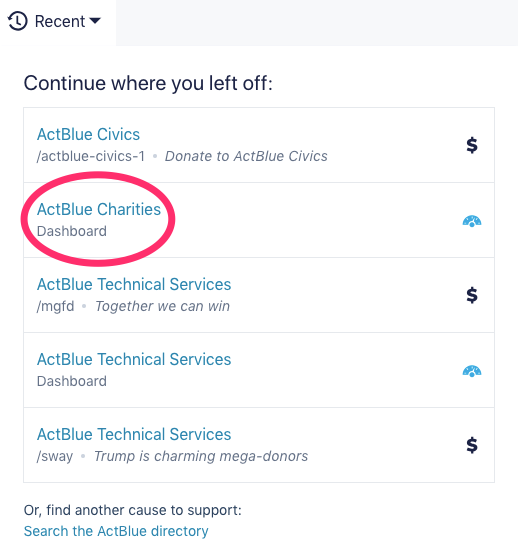 The Dashboard is your central organizing station for all things online fundraising with ActBlue. It contains all of the important tools and information that you’ll need to run your program. We’ll go through each important section of the Dashboard and explain the basic functions, including how to grant access to other staffers and access your donor information. 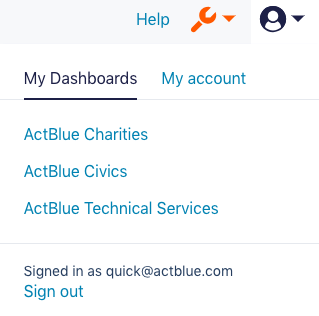 When you’re logged in to ActBlue you’ll see the User menu icon in the navigation bar at the top of your screen. Opening the User menu will bring you to the My Dashboards tab, where you’ll be able to easily select any of the Dashboards you manage. Additionally, you can use the Recent menu in your navigation bar to quickly go to a Dashboard that you recently visited. This is the homepage of your Dashboard -- here, you can analyze all of your fundraising data and create new contribution forms. You can also create event or merchandise forms here. You can view fundraising data from the last week, month, year, or any customized length of time. You can get to know your donors and make smarter decisions by tracking how many people used ActBlue Express, PayPal, Apple Pay, or a mobile device when donating. Everything is tracked in real-time so you can make faster decisions when it comes to your fundraising program. 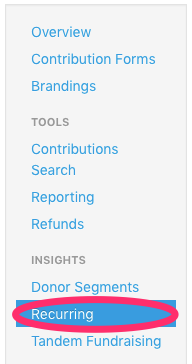 To track your recurring donations, go to the Recurring tab in the Insights section of the menu on the left side of your Dashboard. There are a lot of benefits to a recurring program, but the main one is more money. That’s because donors can chip in a small amount each month, rather than making a large upfront contribution. It also means that you’ve got a good sense of what the next round of fundraising might look like at your organization. You’ll be able to see how many months your recurring contributions typically last, which will allow for better monthly budgeting decisions. Check out this page for more reasons to start a recurring program. And check out our guide to building a recurring contribution program to get started! In the Contribution Forms tab of the menu on the left side of your Dashboard, you can access your campaign or organization’s forms all in one convenient place. They’re listed in descending order by default, starting with the most recent form that was created. Click on any of the headers to sort the forms the way you’d like. This list shows your form names (or slugs), the number of contributions they received, the amount of money they raised, and whether or not you chose to brand your forms. You can also duplicate a form from this page, with just the click of a button. Further, if you want to hide a form, just hit the Archive button that looks like a box at the right of the table. If you choose to archive a form it can no longer be viewed, which also means it can no longer receive contributions or be edited, but you can revive a form if you need to. You can read more about archiving forms here. You also have the option to Download a contribution form CSV report on the Contribution Forms page. This report will give you a detailed breakdown of your contribution forms, including how much they raised and the forms’ titles. Finally, you can search for a specific form by page name. Simply type in the name you gave your form in the box at the upper right-hand corner of the table. You can also use this tab to assign default settings to your contribution forms. Follow this link to learn more about adding default settings to your forms. If you are viewing a contribution form, you can get to the Contribution Forms page of your Dashboard by clicking on the "View all forms" button in the form menu on the left. You can also use the Recent menu in the navigation bar at the top of your screen to quickly go to a contribution form that you recently visited. Go to the Settings tab in the Admin section of the menu on the left of your Dashboard to update your team’s contact information. The address listed here will be the same place we send your checks, which means it’s extremely important that it’s always up to date. We want to make sure you get your money! Great fundraising comes from a great team! You can add team members to your account in the User Access tab of your Dashboard. If that person doesn’t have an ActBlue account yet, we’ll send them an email with instructions for creating one. Users who already have an ActBlue account will be able to see your campaign or organization's Dashboard the next time they login. Click “Remove User” to revoke access. It's easy to set up email alerts for contributions or refunds over a certain amount. When viewing a contribution form, click the Alerts button in the form menu on the left. Enter the email address that will receive the alert, choose whether the alert is for contributions or refunds, and set the threshold for receiving an alert. You can sign up both admins and non-admin email addresses for email alerts. Although it might be tempting to hear from us about every donation or refund, we recommend choosing a relatively high number so you won’t be inundated with emails. Click the small orange "Save" button to the right of your alert to finish the set up. If you no longer want an alert, click the small red "Delete" button. Use the small grey "Edit" button to change an alert. 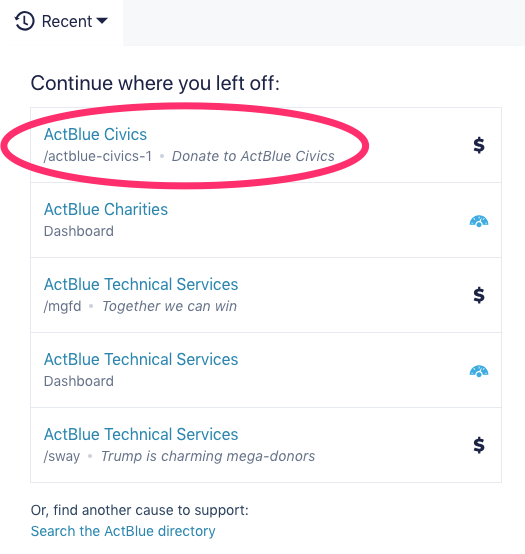 The first thing you should do once you’ve set up your ActBlue account is create a contribution form to be used on your website or in your fundraising emails….